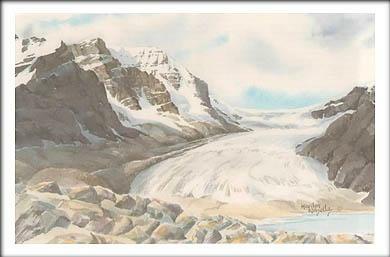 A hundred years ago the Athabasca Glacier completely blocked Sunwapta Pass. Today the edge of this massive river of ice has melted back over a mile from where the highway now traverses the pass. Flowing from the Columbia Icefield, the glacier's ice is often several hundred feet thick. Meltwater from the glacier eventually flows into the Arctic Ocean.